“Who says excitement doesn’t ‘PAY’ off. Mine just did today!! From sheer excitement alone of sharing my newfound health with friends, they started Trévo and I got paid for it!! !” ~ Debbie P.
“In my first 12 months with Trévo, I have been able to earn more than I made in my full-time job. So, I retired from the corporate rat race and am now a full-time work-from-home dad. Life is great thanks to Trévo!” ~ Samuel J. “Trévo is amazing!!! Not only does my family experience natural energy throughout the day, but I have a piece of mind knowing that my family is getting all the nutrition they need. Guess what? Just got the mail…we didn’t have ONE check, but TWO checks from Trévo!!! This is AWESOME.” ~ Trina M.
“Just one year ago, I lived in a rent house with three other guys. I was deeply in debt and, basically, just wandering through life without any kind of purpose. Then a friend introduced me to Trévo. The training and tools that Trévo offers really helped me realize that I could achieve anything I put my mind to. Now I have a home of my own and a Trévo home-based business that’s growing like crazy. I’ve discovered that a job is what you’re paid for, but purpose and empowered dreams are what you’re made for. So thank you, Trévo, for opening my eyes to a wonderful world filled with purpose, passion, and prosperity.” ~ Ned K.
“What an amazing thrill to get paid for having fun and helping other people achieve their own dreams! Those beautiful green checks just keep pouring into our mailbox every day. Thanks to this exciting company, our future has never looked brighter!” ~ Trevor S.
“Drinking and sharing Trévo with others has amazingly huge perks. I love enhancing my family’s lives with all my green Trévo checks. 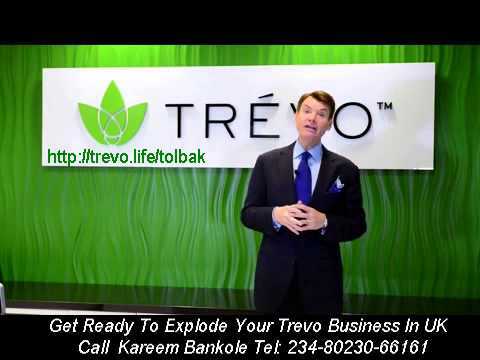 What separates us from everyone else is that Trévo will be the next billion dollar brand. Don’t regret not getting busy now in sharing this life-changing opportunity. Your family will be glad you did.” ~ Jaye G.
“It is so much fun to dream again, then to make those dreams become a reality by sharing Trévo! Imagine going along in life thinking you were getting close to retirement in only 5-10 years, then suddenly your world is turned upside down due to an unexpected health issue. That was us.! But as one door closes another opens, and soon God led us to someone who told us about the Trévo opportunity and product. In just a few months, our income with Trévo is allowing us to make our dream of being out of debt a reality! We are trading in the farming equipment that plants seeds for a one-time harvest for a luxury car that will take us near and far to plant the seeds of hope and empowered dreams. Trévo truly changes lives forever!” ~ Mike and Randa W.
“I love that Trévo sends me checks in my mailbox every week just for sharing how amazing Trévo makes me feel! I have awesome energy, a clear mental focus, my blood sugars and blood pressure are balanced out and I have increased endurance levels!!! I love Trévo!” ~ Kelly S.
“After twelve years of marriage, I found myself in a position I never dreamed I’d face. Suddenly, I was a single mom with two children relying on me to provide for them. I had been a stay-at-home mom for nine years and really felt unqualified for corporate America. A friend suggested I take a look at Trévo, partly for health reasons and partly because of the amazing financial opportunity. I’m now a busy, successful Life & Health Coach with my own business! Trévo has given me a way to enjoy financial freedom and empowered dreams. I receive checks from Trévo regularly and my family’s lives are definitely looking up. Thanks for being there for us, Trévo!” ~ Joy A. “I’ve lost 35 pounds using Trévo and with the fabulous green checks I receive every week for sharing Trévo with others, I was able to go out and buy a whole new wardrobe! Love Trévo!” ~ Penny L.
“I love losing the unwanted pounds and having tons of energy from Trévo! And besides that, an income to be able to stay home with my kids!! !” ~ Melissa G.
“Trévo is such a blessing to our lives. My husband is a Life & Health Coach, and he absolutely loves it. He looks forward to talking with people every day about the opportunity to change their health and their finances. We’re seeing Trévo help many of our friends, just as it has helped us!” ~ Jessica L.
“Trévo has absolutely transformed not only my health, but my finances as well. I began praying “The Prayer Of Jabez” over my Trévo business every morning. And wow, how God has increased my territories and blessed my through this amazing company. I am a believer in tithing and never stopped to think about the amount I was giving back to Him until I got my contribution papers. I was numb when I realized. I was able to give more to the kingdom in one year than what I earned in entire previous years. God has so blessed me through this amazing opportunity and through the friendship of Mark and Holli Stevens.” ~Penny L.
Trevocoach.com | All Rights Reserved.